Jan’s daughter got married last summer and as well as fulfilling her role as MOTB, she also designed and arranged her daughter’s wedding flowers, with help from a team of friends. We first met when Jan came to one of my flower arranging workshops at her local church. She then went on to join me at a workshop to learn how to make a floral garland at my “pop up” flower school in Westwell and has since signed up for further flower arranging classes with Kent Adult Education. Read on to find out more about Jan, her flower arranging story and her daughter’s amazing wedding – with a Great British Bake Off twist! I was bitten by the flower arranging bug when I started attending a church in London 30 years ago and was particularly struck by how flowers are so often a key part of how we express joy and grief. Flowers have a way of touching our hearts, triggering memories, with their colour, smell and infinite design, be they a single white lily or an abundance of summer colours. I’ve been on the flower arranging team at my Church in Canterbury for many years where I’ve been able to watch, learn, arrange and work alongside the experienced members of the flower arranging team. It took quite some time before I began to understand shape and form and that ‘less can be more’. Four years ago I retired from a long nursing career. This meant I now had the time to be more involved with church flower arranging and to attend some of your workshops and short courses. It has taken me a very long time to feel ‘relaxed’ when I am making arrangements. In truth, I often felt quite stressed about it, perhaps because of the responsibility to produce something appealing to others, and probably because despite being a keen gardener, I knew very little about the names of flowers and even less about the greenery. I was born in the East End of London, as were both my parents. I love London and it is always a joy to spend time there. My hubby Neil is from Greenwich and we met when I was a student nurse at Guy’s Hospital. This year we visited the pub where we first set eyes on each other 35 years ago, The Yacht on the River Thames at Greenwich. We have been married 32 years and moved to Canterbury in 1990 because Neil’s parents had retired to Whitstable, and his brother’s family had also moved into the area. Our eldest daughter Hannah, was three years old at the time and Sarah was born in Canterbury a few weeks after our move. Neil and I both had careers in the NHS. I worked as a staff nurse, ward sister and clinical teacher at Guy’s hospital. I have always been involved in the caring world, both professionally and personally. I have spent some time as a childminder and began working with children with disabilities. In 2004 I joined the local Health Visiting team. Neil is currently the Chief Officer of Age UK Canterbury. He has a keen interest in acting and has completed a professional course at The Rose Bruford College, Sidcup. He recently appeared in ‘Southcliffe’ as a journalist. It is only since my retirement that I discovered I have an artistic side which is expressed in flower arranging and card making. Plans for Hannah and Tom’s wedding began in earnest at their engagement. Their ideas for a vintage style wedding were incorporated into their engagement party. They designed vintage style ‘save the date’ cards, put up bunting and I decorated jam jars and filled them with them with flowers. From that time on we began searching charity shops for fine bone china tea cups, jugs, glass decanters, suitcases, books, watering cans and even a ladder. I eventually gathered over 100 tea cups and saucers. For the wedding favours I made 82 tea cup candles. 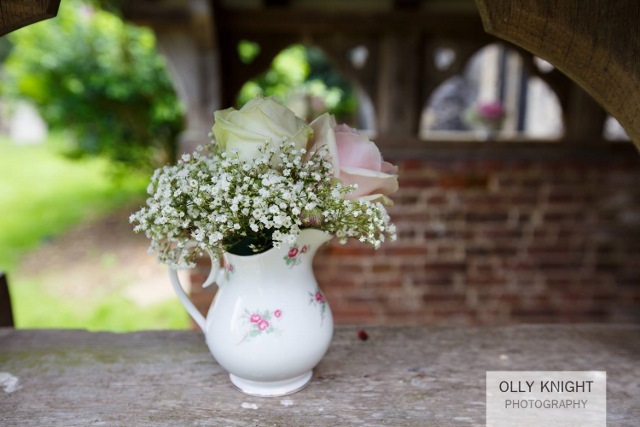 The remainder of the tea cups and jugs were filled with flowers and were used to decorate the church and venue. Hannah set up a Pinterest group page in which she was able to set the scene for the colours and vintage props she would most enjoy at her wedding. 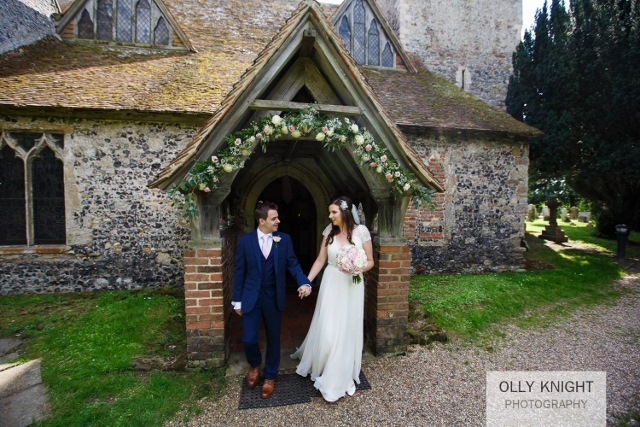 Hannah and Tom chose Preston Court as their venue and St Mildred’s church for their wedding service. The large barn at Preston Court has two mechanical organs from floor to ceiling and one of them is coloured duck egg blue. This is one of Hannah’s favourite colours and fitted perfectly with her choice of pastel pink and cream for the flowers. I started to experiment with flower arrangements in tea cups, sending Hannah photos so that she could choose her preferred flowers. I remember coming across a book you had reviewed and recommended on your Facebook page called ‘Vintage Wedding Flowers’ by Vic Brotherson. This book proved invaluable and we chose sweet avalanche roses, avalanche, white wax flowers, pink and white astrantia, eucalyptus and huge amounts of gypsopilia. Hannah wanted flowers and not foliage in her arrangements, so there was an abundance of roses. 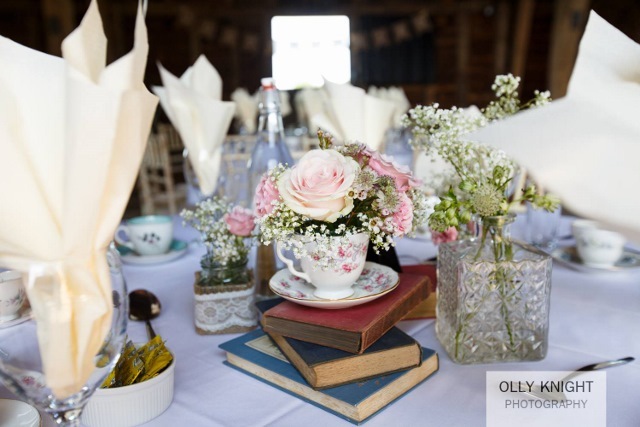 For the wedding breakfast tables there were 10 tea cup arrangements, 15 decanter arrangements, 21 jam jars to fill, 10 small jug arrangements, and also two watering cans to fill as well as arrangements for our home. The key to all this was planning. I realised that just as in my role as a nurse I had to be calm and professional, and hold significant responsibility. These proved to be essential skills in my new role as flower arranger and provider and maker of key props for my daughter’s wedding. I drew plans and sketches of each of the flower arrangements detailing the exact number and type of flower required. I learned how to use chalk paint, and used this new skill to paint suitcases, picture frames and a ladder. I learned how to make tea cup candles. I covered jam jars in hessian and lace and I made confetti cones. I collected containers for the arrangements to be safely transported to the venue. I knew that I would not be able to make over 60 arrangements (which included three pedestal arrangements with pillar candles, 12 pew end arrangements and a large church garland), plus bouquets and buttonholes on my own. 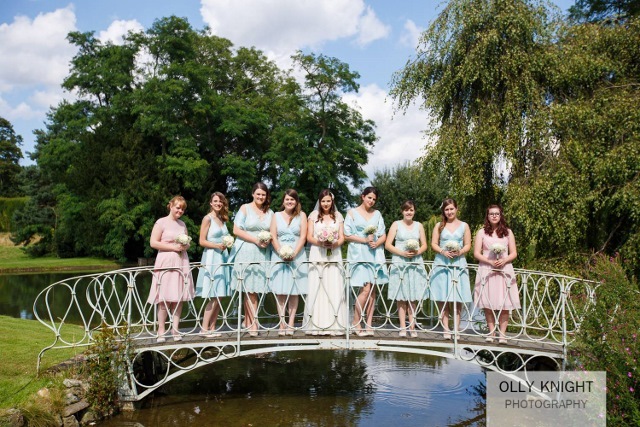 I was very blessed that two dear friends agreed to help me with the church and venue arrangements and another friend made the Bride’s bouquet, eight bridesmaids’ bouquets and the button holes. Three days before the wedding the flowers were delivered to my home and I spent a whole morning conditioning all the flowers and putting them into labelled buckets ready to be made up later. I chuckle to this day that while I was conditioning £500 worth of flowers I also made a large Victoria sandwich and entertained four of our wonderful relatives who had travelled from Scotland to join the wedding party. That afternoon we made all the venue arrangements. My sketches with flower types and numbers proved invaluable as we knew exactly what we were doing and I had already soaked the flower foam and taped it into the containers and cups, before my friends arrived. Another friend provided copious amounts of tea, more cake and helped to keep everything tidy. The afternoon before the wedding we transported the flowers to Preston Court, and with my plans their staff laid out the wedding breakfast tables. That afternoon Hannah and Tom with some friends and family decorated the Barn with ribbons and pompoms while I spent the afternoon in the church with two friends putting together all the church flowers. By the time we came to making the garland I was exhausted – and the garland fell down and had to be reconfigured. On the day it was perfect. It was even used for another wedding later that week! Our family friend made outstanding bouquets and Hannah fell in love with hers and held it nearly all day. As the Mother of the Bride I wanted to enjoy time with Hannah and also ensure she had all the help she needed before she left our home for her wedding, so the help we had with the flowers was invaluable. It was a privilege helping Hannah and Tom with their wedding plans. Tom made signs for the venue, helped Hannah with masses of printing, especially for their beautiful wedding invitations which they tied with pearled lace, they designed and made their table names, labels for each guests favour, and the table plan. They spent a great deal of time sourcing their wedding experts which resulted in great food, brilliant photography and videography. Their musician Abs Pascoe provided vocal coaching for Sarah who sang a medley of Hannah’s favourite love songs in the church while they were signing the register. Abs and her partner played in the church and afterwards on the lawns of the venue while we drank Pimms and Gin fizz on the lawns by the lake. The venue staff were always available for help and advice and we were blessed with warm weather. 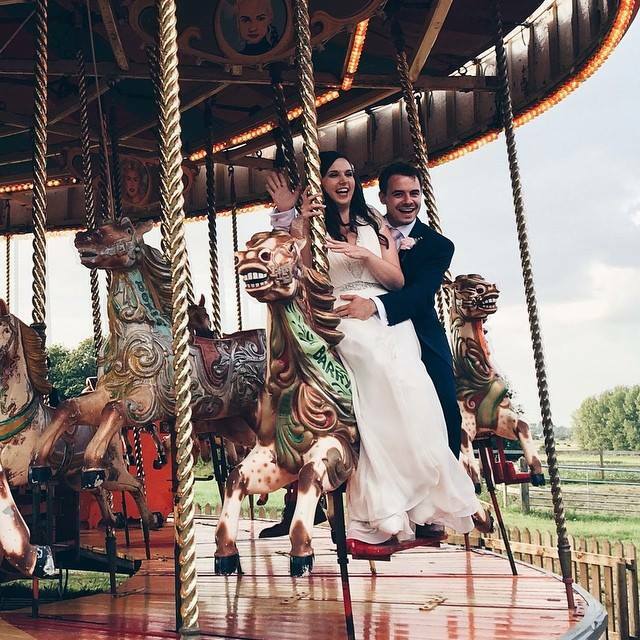 Hannah and Tom said they felt like they were walking on air all day … their joy was infectious. This video clip captures the mood perfectly. And what about the Great British Bake Off connection? Instead of a wedding cake Hannah and Tom invited friends and family to bake cakes and they would choose one on the day to be their wedding cake. Nine amazing cakes were made, including a lovely train cake from their three-year old page boy. 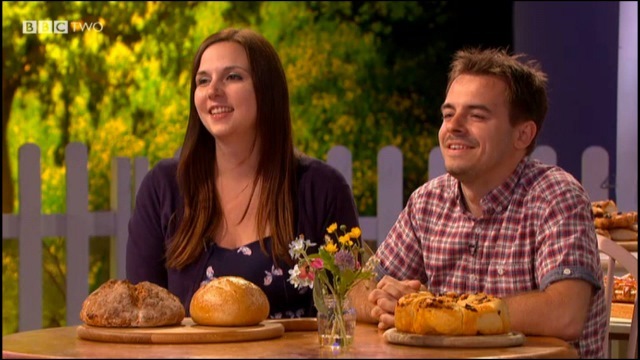 The production team of GBBO got to hear about this and invited Tom and Hannah to join them as guests on ‘An Extra Slice’ hosted by Jo Brand. Hannah and Tom had a fab time as guests of this show which they attended a day after returning from their San Francisco honeymoon. Kent Wedding magazine chose to show four pages of photos from Tom and Hannah’s wedding in their January/February 2015 edition. Their vicar Jo made the service a delight with her warm welcome and wise and loving words to the new Mr and Mrs Page – truly a wonderful wedding. What flower plans have you got over the next few months? Since Tom and Hannah’s wedding I have made a bride and bridesmaid bouquet and button holes as a gift for a dear friend’s wedding. I have also made venue and church arrangements as a gift for another friend. Last month I was brave and made two funeral arrangements. Next week I’m making another funeral arrangement and the following day a spring bouquet for friends who are having a blessing service for their marriage. I continue to make cards which are sold for 100% profit to a local charity. Sarah is now living in Paris so I am sure there will opportunities to enjoy the Parisian flea markets looking for vintage items suitable for flower arrangements. I’m not sure how ‘Blossom Tree Vintage’ translates in French! Blossom Tree Vintage is the name of a joint project which Hannah, Sarah and Jan are hoping to take forward as a result of all that they learned on the amazing journey of Hannah’s wedding. Sarah is a graduate in fine art photography and Jan continues to collect vintage pieces and make cards which may have the basis for a business in the future. … Oh Jan – it’s been my pleasure! 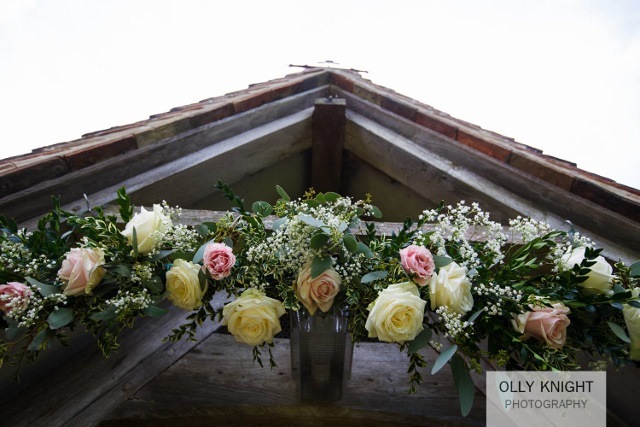 Many thanks to Olly Knight for allowing me to use his images of Hannah and Tom’s day.